Getting confirmation that you are pregnant is a life-changing moment for any woman. For someone who has been through IVF, it is especially poignant and powerful. It’s quite likely that you have been longing for this positive pregnancy test for many years, and when it finally arrives, the emotion may be overwhelming. Having gone through the rigors of IVF treatment, possibly several times, you’re now entering a new stage of care. In most respects, an IVF pregnancy is like any other pregnancy, but there are a few differences that you should be aware of. Knowing what to expect can help ease your stress at this amazing time in your life. Excitement is usually the first response, but your emotional reaction to finding out that you are pregnant may be complex. Even if you are overjoyed, a wave of anxiety may not be far behind. This is true for any pregnancy, but it’s particularly intense for women who have gone through IVF. When you’ve already invested so much in the pregnancy, the fear that something could go wrong may be extreme. Some women are upset to discover that they don’t feel as excited as they thought they would. This is also normal. You’ve been through a lot. Many women who have struggled with infertility have dealt with a lot of disappointment and loss, especially if they have suffered through the heartbreak of miscarriage. Feeling cautious or even numb, especially in the early weeks, is a natural response. It may be some time before it feels safe to be excited or joyful. For some women, those feelings don’t arrive until their baby is finally safe in their arms. Don’t judge yourself if you don’t feel the way you expected to feel. You may have been part of an infertility support group, and finding out that you are now pregnant can bring up surprisingly strong feelings of guilt, as if you have left your cohort behind. Some women have said that once they became pregnant they felt terrible about all the bitter thoughts they had about pregnant women when they were struggling. The most important thing you can do is give yourself room to feel whatever you are feeling. Offer yourself compassion and acceptance, and don’t be afraid to talk about your emotions with a trusted friend or therapist. You are not alone in your feelings, no matter how shameful they may seem in the moment. Your need for support doesn’t end because you’ve become pregnant. Women who have undergone IVF have an elevated risk for depression during their pregnancy and postpartum. Taking care of yourself during your pregnancy is not just about your physical needs: your emotional health is also extremely important. Deciding to tell people that you’re pregnant can feel fraught after the experience of IVF. Some people are very open with friends and family about their treatment process: if your best friends know that you have had an embryo transfer, they may be waiting with baited breath to hear your result. This can be a great source of support and encouragement, but it may also feel like external pressure, adding to your anxiety that something could go wrong. Others prefer to keep the details of their IVF experience private, which is also a completely valid choice. In this case, you may want to keep the precious secret of your early pregnancy to yourself for a while. People choose different markers for when they decide to announce their IVF pregnancy. For some, it’s the first HCG doubling. For others, it’s when they hear the heartbeat or see the confirmation on the ultrasound. Still others wait until the end of the first trimester. There is no right or wrong answer, so do whatever feels right to you in the moment. Once your fertility clinic has confirmed your pregnancy, you can expect to stay under their care for 6 to 8 weeks before being transferred to the care of an ordinary obstetrician. This is so that they can support you and keep a close eye on how things are developing during these crucial first weeks. Your doctor may decide to keep you on progesterone support for several weeks into the pregnancy. This helps the lining of your womb develop and can help minimize the risk of miscarriage in some pregnancies. How long your doctor asks you to continue taking progesterone will depend on the specific details of your case. If you’ve been using injectable progesterone, you may be able to switch to an oral or suppository form at this point. Your clinic is likely to ask you to come in for regular blood tests in the first few weeks. There are a few reasons for this. They may want to monitor your progesterone levels, especially if you are taking supplementation. They will want to see that the HCG levels are continuing to rise, and to check for extremely high levels, which could indicate that you are carrying twins or other multiples. They may need to check your estrogen levels in case you are showing signs of ovarian hyperstimulation syndrome (OHSS). The clinic will probably schedule several ultrasounds during this time period. Most importantly, they are checking to see if you are expecting multiples. It might be too early to tell during the very first one, but you should know for sure by your second or third ultrasound. You may get to see the baby’s heartbeat. Pregnancy symptoms vary greatly from woman to woman. You may feel classical symptoms like fatigue, bloating and nausea, or you might not feel much of anything at all. One thing to keep in mind is that during these first weeks of pregnancy your body is still recovering from the effects of the fertility medications you took during your cycle. Ovarian hyperstimulation syndrome (OHSS) is a side-effect that happens to some women after IVF, and its symptoms can be confused with pregnancy symptoms. If you are feeling especially nauseated and bloated, if you vomit, or if you are in pain, get in touch with your doctor right away. It is possible to be pregnant and have OHSS, but your doctor may insist on extra monitoring and treatment. Most cases of OHSS are mild and will resolve themselves, but in rare instances this can be a serious complication, so don’t hesitate to call if you are worried. Once your fertility clinic releases you to the care of an ordinary OB, the rest of your pregnancy should be as “ordinary” as any other pregnancy in almost every respect, but you may still feel a little nervous. 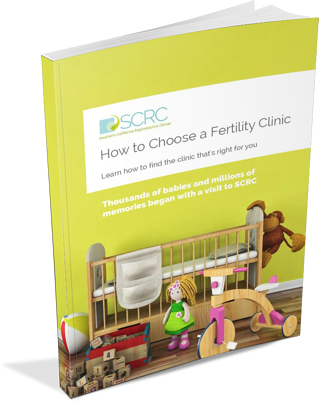 While it may feel strange to go from the intensive monitoring and care of a fertility clinic to the once-a-month visits of regular prenatal care, you don’t need to worry. Let your OB know your concerns, and don’t be afraid to ask for an extra appointment or ultrasound if you are feeling stressed. More than 60,000 women each conceive with the help of IVF, and doctors are familiar with the long road you’ve traveled to get to this point. They are there to help you make the rest of your pregnancy a happy, healthy experience.